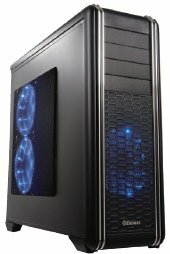 Need a super graphic / gaming workstation with room for a HPTX MB, room for quad duel-slot +310mm depth VGA cards, massive storage for 14+ storage drives, flexible cooling options for up to 13 fans, front USB 3.0 port and dual power supply units mounts? This big powerhouse needs a big housing, and ENERMAX new Fulmo GT chassis is the answer for the big one. It's spacious and sturdy constructed will be able to hold the monsters inside!